When you feel rejuvenated, head out to see beautiful Kauai, the oldest island in the volcanic Hawaiian chain. Kukui`ula Village is a short walk from our condo. Find a new pair of sunglasses. Enjoy a margarita there. Take the short drive to Old Koloa Town for a bit of local color and perhaps some fresh fish to grill on Kiahuna’s outdoor barbecues. Lihue, where your plane landed, is the largest shopping area on the island. For a short driving adventure, head to Spouting Horn. Giant sea turtles are often seen in the surf below the rocky cliffs. 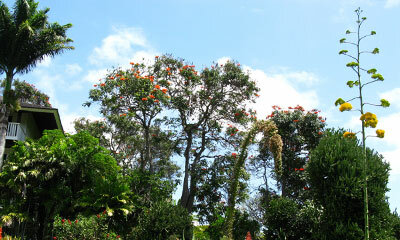 Nearby you’ll find two National Tropical Botanical Gardens--McBryde and Allerton. For a day for sightseeing, consider a drive to the north coast. The pace is slower than on the mainland, so expect to travel at a leisurely pace. Waimea Canyon is another beautiful location, reached by driving west on the south shore. Along the way you’ll pass through several scenic towns where the locals live, work and play. Sports enthusiasts have many fun options here. The island’s best snorkeling is at Poipu Beach, just outside your condo’s door. Poipu Beach Athletic Club is a short walk away. Drive north, east or stay south on Kauai to experience a variety of golfing. Nearby our condo you’ll find a Robert Trent Jones, Jr. designed course. Princeville boasts world-renown champion courses. Plan to see the island from the air in a helicopter, or from the sea via one of the many cruises. Read our take on Relaxing and Romancing in Poipu Beach on Kauai at Kiahuna Plantation.